Block out bright light with this blackout curtain panel. 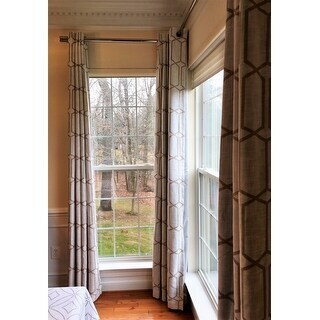 The blended linen fabric gives your window added insulation, and the trellis pattern imparts an updated look. Some of the other reviewers pointed this out, but so subtly that I underestimated how not blue the "soft blue" is. So I'm being more direct and definitive. The picture looks like blue on white, but the curtains are olive on light taupe. Completely wrong for my room, and it's costing me *** to return them. I resent this, because I think that calling a color "soft blue" suggests that it will be blue, so I think the mistake is theirs, not mine. Otherwise, they're actually very nice curtains. Here's the real color. Fabric quality is fine but background color does not match the pictures. It is not a true white but rather more of a light grey. The color does change if you turn the attached black out linner away from the light so its not backlight. But even still it does not read to me like a true pure white. Also I bought 2 panels for one window and the geometric pattern doesn't line up from one panel to the next. Like with a patterened wall paper curtains too need to be sawn so that the repeat of the pattern starts in the same place. Obviously, that wasn't the case here. Overstock Customer Service is always helpful and accommodating and sending me 2 more panels in the hope that I can get two out of 4 that will match.... Stay tuned .....fingers crossed!!!! These are great curtains, I have them in my bedroom where the sun hit when it is going down. 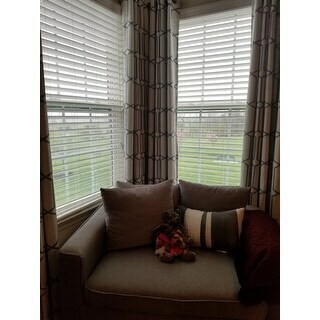 Wish they made a shorter set about 24 inches long, to match so I could put them on the other set of windows in my room. These curtains do a great job of keeping out the majority of the light. I love the pattern and the curtains seem to be blackout like stated, but the color is all wrong unfortunately. I ordered the grey and they look like purple. 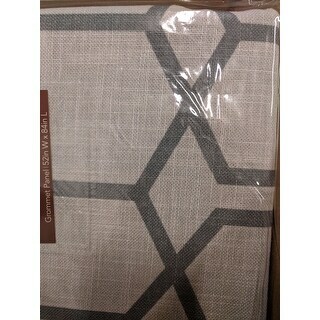 The base color is more grey than the pattern. I will be returning them and I hate it because I love the texture and pattern. I just wish they were the color I ordered. I am very happy with these curtains. The quality seems very nice and they go great with the gray and white color scheme of our room. They do a nice job of blocking out light although I would not consider them a true true black out curtain. I ordered the blue and would warn however that mine do not look blue at all. I would describe the stripe color to be more gray/ green. Color did not affect me tho and I still love them. If you're looking for a true blue you may not be happy. Good quality but the color...? This curtain’s quality is really good! But the color is totally different from picture. I ordered soft blue but it’s not that color at all. It’s more like greenish grey. Actually the color matches our wall color so it’s ok. But if you really want blue one, this is not the one. These curtains are great! When they arrived, I put them in the dryer on a steam refresh cycle and the creases came right out. They are a study material and the pattern is interesting, yet neutral enough that it would work well with most design aesthetics (rustic, mid-century modern, etc). There is a lining, but it doesn't actually block out all of the light. We use ours in our dining room, so this isn't an issue for us, but if you are considering these for a bedroom, just be aware that this isn't a true "blackout" panel. Overall, I'm really pleased with this purchase. Theses are true blackout curtains, just what I was looking for. These curtains are perfect for blocking MOST light. Not complete blackout curtains, which I only expect from darker shaded curtains. The pattern is beautiful, my husband even liked them as they are not too feminine or masculine, and they warm up my living and family room spaces. Perfect quality at a good price, They were better than I thought although I think the Gray looks just a little bit Purple but that’s OK I’m going to make it work. These are really pretty; wish I could keep them. Unfortunately, the lining is gray/silver. Our home owners association states the lining must be white (window coverings facing out). I would love to see lining color included in descriptions. Nice quality. Significantly darken the room, but not completely blacked out. I like the colors, but it is not a pure white -- more of a cream color. Glad to have them! These curtains had more of a woven/linen effect than I was expecting. The lining is good and the color is pretty accurate to the web page. I bought the taupe and it works perfectly with the other taupes in my room. The curtains are beautiful and fit the décor of the room perfect. Not well represented in photos. The linen described is much more prominent in the actual curtains. Though the backing is well done, I would be careful about purchasing these. 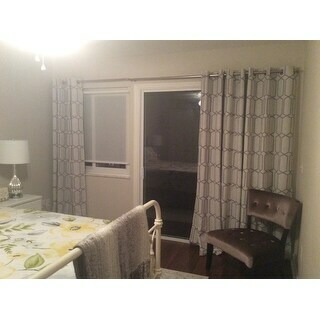 Affordable curtains with high in look and feel - worked great for our project. Contemporary style and nice fabric - colors true to images. Would buy again. Very high quality, they hang beautifully. Better then expected. Room darkening is excellent. I’ve used twice already for some projects and they don’t disappointed. Fabric is great and my favorite color is the gray. It’s almost a taupe gray which is warmer. 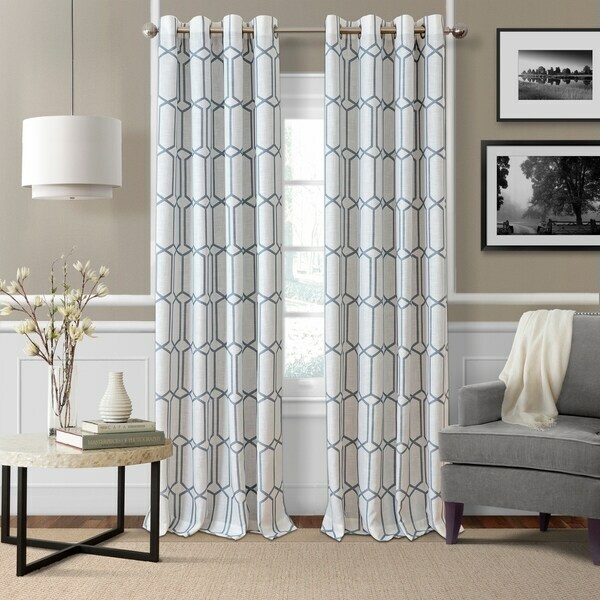 I love this curtains and definitely recommend them. They will transform any room nicely. I love these curtains! They are thick enough to block the sun but still pretty. The color works perfectly in my home office that is dark blue. Beautiful curtains, they look great in my living room. "Will a 1 1/2 in rod fit with these curtains? " "What is the diameter of the grommet? I have 2" diameter rods from previous drapes that I want to re-use." "For the panel with the blue pattern, is the background color white? Also what is the shade of the blue pattern? Is it a gray blue as it appears in picture, or does it have a greenish hue? Thanks"
The ground is white and the pattern is a gray blue. "Does this price include both panels or just one?" "I need 2 of these, 52" x 84" in Gray. The order shows only 1 available. Will you get anymore in stock? If so, when? Thank you!" We do not know if the grey will be restocked. "One curtain has lines that look brown, is this taupe or gray? I am possibly interested in the grayer color. Do these come in 63"? How about 84" in the grayer color?" You can see the sizes and colors we currently have available listed under the options menu. I have sent a request to have the images labeled with their color names. "I need to know if the taupe curtain comes with an antique bronze grommet? Also, is the lining separate from the curtain...I.e., not fused to the curtain? Kay"